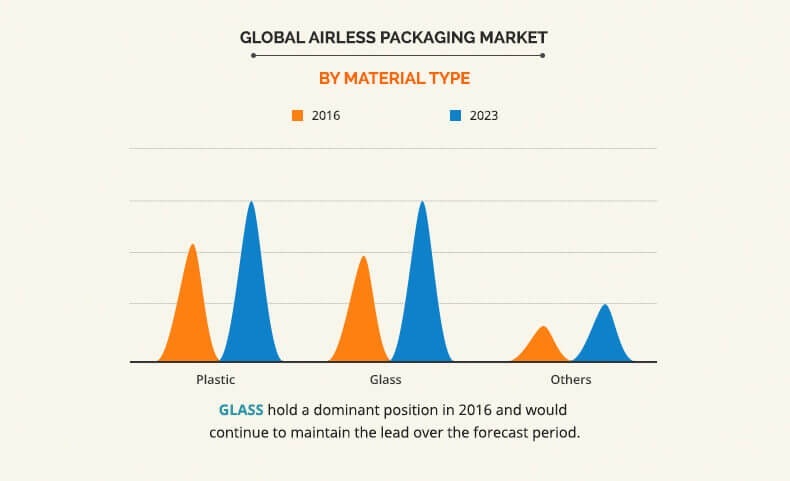 The Global Airless Packaging Market size was $4,046.0 million in 2016, and is projected to reach $5,938.0 million in 2023, growing at a CAGR of 5.9%. The substantial growth in cosmetics and skincare sector fosters the demand for airless packaging systems. Airless packaging systems are non-pressurized dispensing systems that exhibit high restitution rate and avoid wastage by evacuating almost 95% of the product. Manufacturers opt for recyclable packaging materials to cope up with the increasing demand of consumers for eco-friendly products. Consumers nowadays check the labels of the products before purchasing their must haves. For instance, the Weleda launched its antioxidant & skin softening body lotion in a recycled airless bottle. Such developments are expected to substantially boost the growth of the airless packaging market. The global airless packaging market is segmented based on packaging type, material type, end user, and geography. Based on packaging type, the market is categorized into bags & pouches, bottles & jars, tubes, and others. The bottles & jars segment is projected to dominate the global market throughout the study period owing to its extensive volumetric & pressure efficiency range. Based on material type, the market comprises plastics, glass, and others. The plastic segment accounts for the maximum market share due to its light weight, ease of availability, low cost, and ability to be molded in a variety of shapes and sizes. The end-user segment includes personal care, healthcare, homecare, and food & beverages. The end user segment comprises of personal care, homecare, healthcare, and food & beverages. Among which, the personal care segment is expected to grow at the significant growth rate during the forecast period due to increase in demand for beauty, skin care, and hair care products globally. The regions taken into consideration are North America, Europe, Asia-Pacific, and LAMEA. Among these, North America and Europe hold a significant share in the global market. This is attributed to the recent technological advancements, and favorable demand for recyclable & high end products. For instance, in Europe, most of the consumers are inclined towards green products rather than recyclable products. The U.S., Rest of Europe, Rest of Asia-Pacific, and Canada possess significant potential for airless packaging manufacturers due to increase in awareness for natural and organic products in these regions. Increase in demand for prestige products around the globe has accelerated the growth of the airless packaging market, especially in personal care sector such as haircare, skincare, and cosmetics. The African and Middle-East countries have witnessed an increase in sale of beauty & haircare products in the recent years. Therefore, increase in sale of personal care products would propel the growth of the variable displacement pumps market. Moreover, modernization and increase in per capita income of the people in developing countries has fueled the demand for homecare products, which in turn are sold in containers based on airless packaging technology. Factors such as need for better packaging and increased adoption of airless packaging technology drive the market growth, as these facilitate low wastage of the product. Moreover, the shelf life of the product drastically increases with the use of such packaging. Airless packaging helps to achieve a high evacuation rate with precise dosing. Thus, use of dispensing pumps and high quality materials such as plastics & glass for packaging have improved the quality of the products. The Asia-Pacific and LAMEA airless packaging markets are expected to exhibit significant growth in the near future, owing to rise in consciousness regarding personal appearance, increase in population, significant growth in GDP in the developing countries, rising disposable incomes, and increase in demand for natural and organic products. 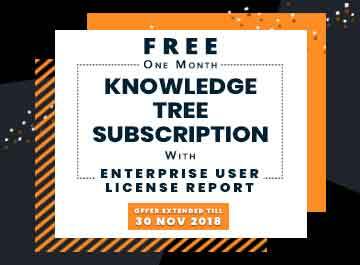 Technological advancements, less impurity, high product shelf life, and design upgrades for products are expected to drive the market growth in future. The key players profiled in this report are ABC Packaging Ltd., Albéa, AptarGroup, Inc., Fusion Packaging, HCP Packaging, Libo Cosmetics Company, Ltd., Lumson SPA, Quadpack Industries, Raepak Ltd., and Silgan Dispensing Systems. The study provides an in-depth analysis of the global airless packaging market along with the current trends and estimations to elucidate the imminent investment pockets. 8.2. ALBÉA BEAUTY HOLDINGS S.A.
8.5. HCP PACKAGING (SHANGHAI) CO. LTD.
8.6. LIBO COSMETICS CO., LTD.
Airless packaging technology has been implemented widely over the years in personal care applications, including cosmetics, oral care, hair care, and skincare. Increased demand for personal care products, growth in population, and rapid modernization are projected to drive the demand of homecare & personal care products, which in turn are packaged using airless packaging technology. Market players have developed new ways to offer recyclable products and reduce wastage of the products. Airless packaging ensures high restitution rate and almost 95% of the product evacuation, which make it an ideal choice of packaging for manufacturers. For instance, Herbfarmacy introduced a new range of airless pump recyclable packaging to the airless packaging market, which includes whole body lotion, wash-off cleansing mousse, and four face creams. Growing demand for beauty care products with advanced properties and the numerous advantage of using airless packaging system drive the market growth. The proliferated growth of the cosmetics and pharmaceutical industries is expected to propel the demand for airless packaging market.